So I haven't felt very creative this weekend and so I did a little surfing around some of my favorite craft blogs and happened upon this very cute idea on Crafty Chicks blog. 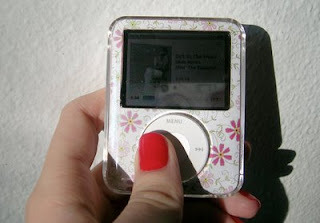 She has a link to a place you can download a free template for a 3rd generation iPod Nano so you can create your own personalize look for your iPod. I was excited because we just happen to have the clear case and this version of iPod nano. Cute, cute idea!! this looks so awesome! What a cool idea!